Pictured outside Bank of Ireland Ellison St. Castlebar, members of the bank management team welcoming Mayo team player Keith Higgins, bank official, who recently transferred from the Castlerea Branch to the Castlebar Branch of Bank of Ireland. On Monday 16th September between 2pm - 5pm Keith will be available in the Castlebar branch to meet both customers and children alike to sign jerseys, footballs etc. 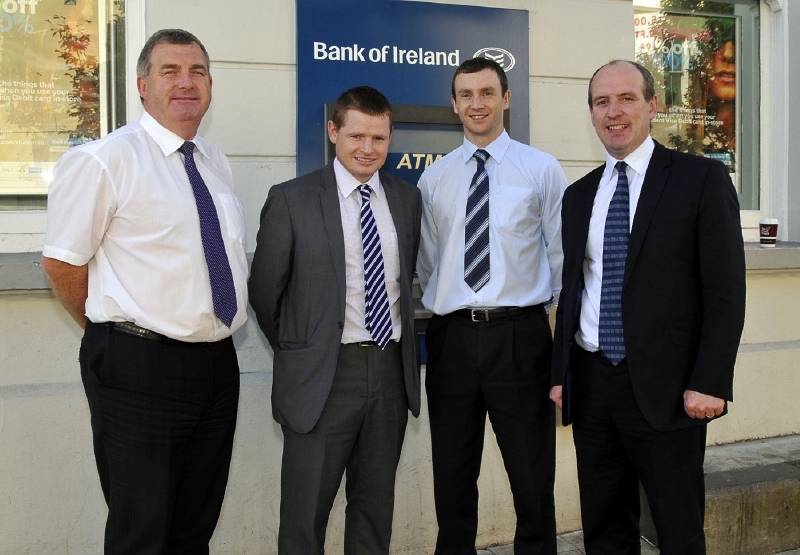 L-r; Jim O'Shea, Senior Business Manager, Tomas Diskin, Branch Manager , Keith Higgins and Aidan Beirne, Area Manager, North West. Photo © Ken Wright Photography 2013.